Your business can collect reviews from your clients, and publish them in a separate tab of your scheduling webpage. This quick guide will take you through the review collection and publication options at your disposal. First, make sure that you have enabled Customer Reviews, under Settings (gear icon at the top right) > Customer Reviews. When review collection is enabled, a review request email is sent 24 hours after a someone's first appointment with your business. Returning clients will receive review requests after appointments that fall more than the interval you select under "Frequency of Review Requests". You have the option to send automatic requests no more frequently than every 30, 60 or 90 days. 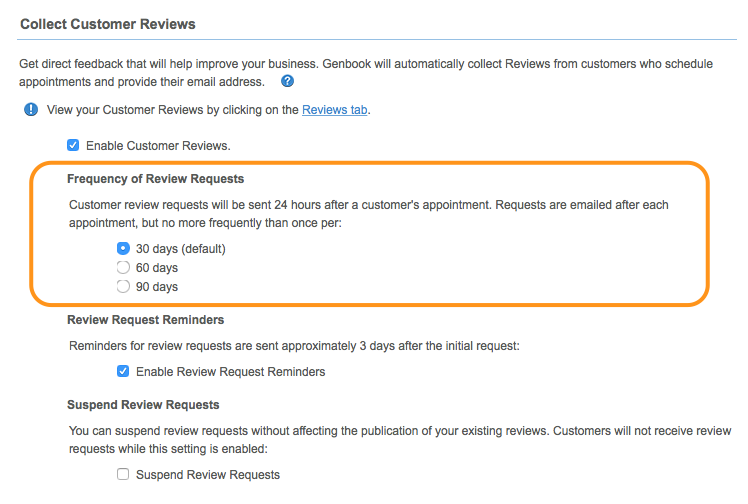 You can even enable an automatic reminder email to be sent 3 days after a review request that did not generate a review. 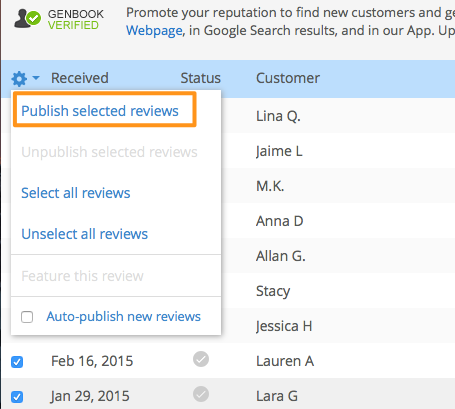 TIP: You can continue publishing reviews, without collecting new ones for a period of time. To do this, check the box beside "Suspend Review Requests". Below is an example of the review request email customers receive when review collection is enabled. You can preview the review form itself from the Reviews tab. Manually sending Review Request emails: You also have the option to manually prompt a Review Request email to your existing customers, once every 30 days (independent of their appointment dates). This can be done from their customer records, in your Customers tab. Just navigate to the customer's record, then, on their Summary page, click the "Send review request" link to send that email. Manual review requests can also be sent from our Manager app. On the Customer Reviews page (Settings > Customer Reviews), you can choose whether or not to automatically publish new reviews. Choosing to automatically publish new reviews means reviews will be published to your as soon as they are submitted. Choosing NOT to automatically publish reviews gives you the opportunity to read them before you decide to share them with the world. 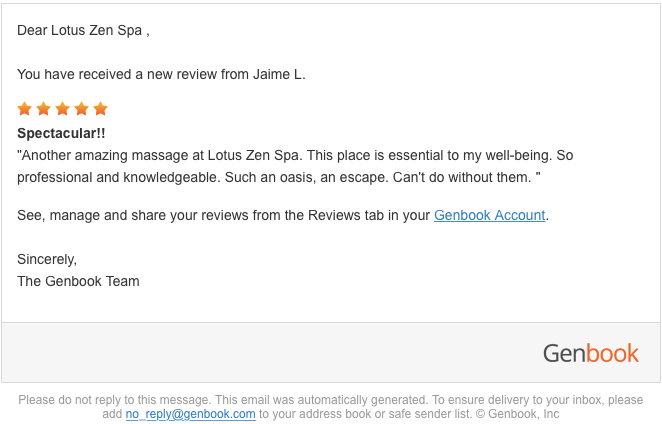 Genbook will notify you, by email (and push notification, if you're using the Manager app) each time you receive a new review, so you don't have to worry about them slipping through the cracks. 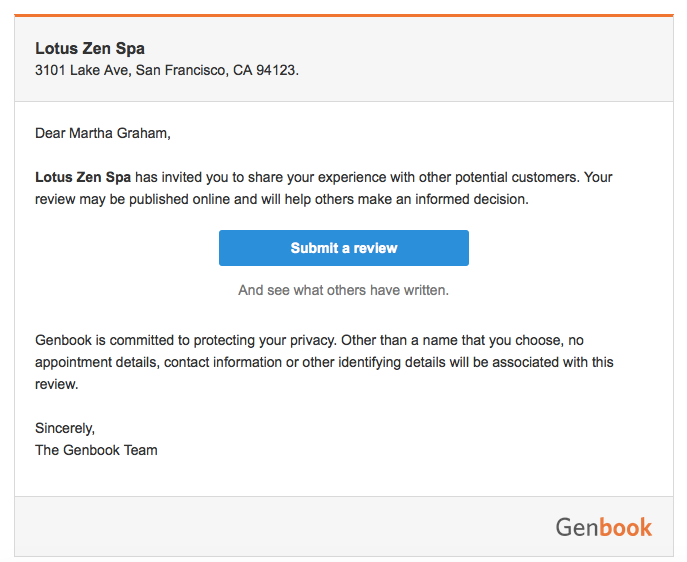 To publish a review from the Desktop site (www.genbook.com), first select a review by checking the box beside it. Then, click the gear icon to the left of "Received". You'll see a little dropdown menu that will give you several options of what to do with that review. If it's not published, you'll have the option to "Publish selected...". TIP: To unpublish a review, check the box beside it and choose "unpublish selected..." from that same drop-down. You can also manually publish and unpublish reviews from the Reviews section of Manager, by tapping the little on/off radio button at the top right on a selected review. You have the choice to display a "Customer since" date on each review, which can give your reviews even more power if you've had customers booking with you through Genbook for a long time. 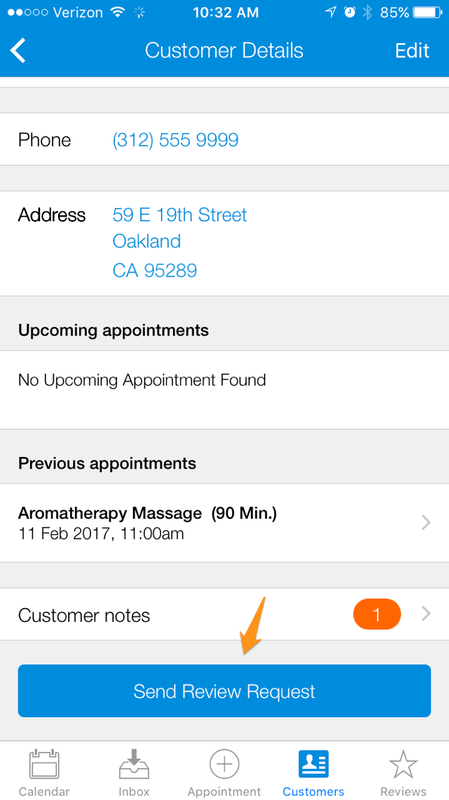 The date listed will include the month and year of the customer's first appointment with your business in Genbook, so if you've just started using Genbook, you may wish to hold off on displaying that "Customer since" date for a few months. Another important choice you can make on the Customer Reviews page is whether customer names will be published, or hidden to protect your customers' privacy. 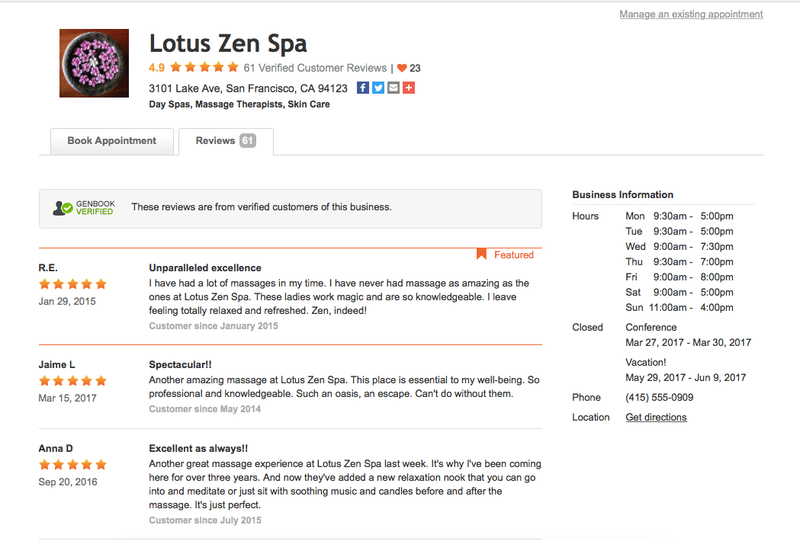 Finally, you can even feature your favorite review on your scheduling page. To do this, go to your Reviews tab and check the box beside the review you want to feature, then click the gear icon at the top left and select "Feature this review". 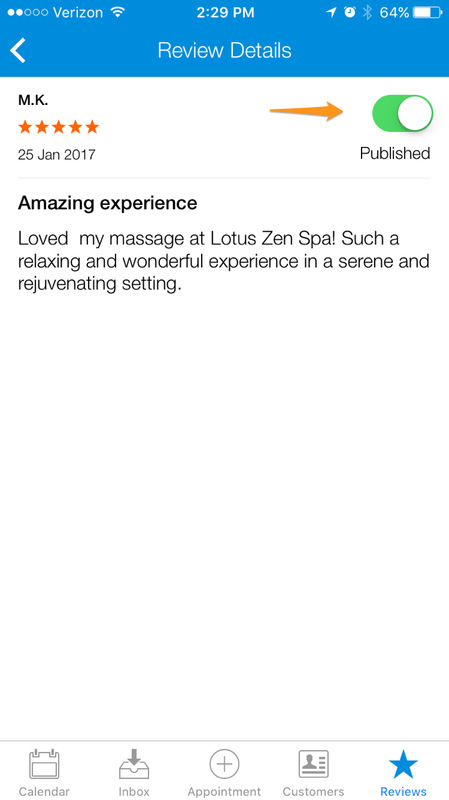 Published reviews are also visible on both the mobile scheduling site and the Genbook app.